Israel expects a new Iranian cross border attack from Syria, as Iran seeks to end increase in anti-regime activity. A day after Israel celebrated its 70th birthday the conflict with Iran escalated, as a host of Iranian and Hezbollah leaders threatened the Jewish state with destruction and annihilation via a two-front missile war which they said would drive the Jews into the sea. Prime Minister Binyamin Netanyahu immediately responded to the new threats and said on Friday that anyone who dared to harm Israel would pay a heavy price. 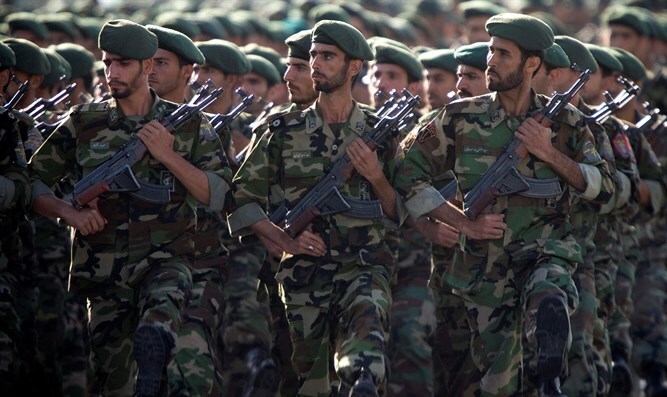 "We hear threats from Iran, and the Israeli forces are prepared for every possible Iranian move. We will fight whoever tries to harm us. We will not shy away from action against those who threaten our security. They will pay a heavy price," Netanyahu said during a special cabinet meeting in honor of Israel’s 70th Independence Day. "Do not trust your air bases they are within the range of fire. Our fingers are on the trigger and the missiles are ready to launch. The moment the enemy decides to act against us, we will launch them," Salami said. Tensions between the two countries spiked at the beginning of February when an explosive-laden Iranian drone entered Israeli airspace near the Sheikh Hussein border crossing between Jordan and Israel, in the northern Jordan Valley. The drone, which apparently was on its way to launch an attack on the nearby Israeli city of Bet Shean, was shot down by an Israeli AH-64 Apache attack helicopter. The serious incident was followed by 12 Israeli airstrikes on Iranian targets in Syria and marked the first direct confrontation between Israel and Iran. One of these targets was the T-4 air base near the northern Syrian city of Homs, where Iran was operating its fleet of drones. The base was again attacked by the Israeli Air Force (IAF) on April 10th - this time to destroy an advanced Iranian air defense system which was installed after the earlier IAF strike on February 10. Israel and the US military are reportedly working together to stop Iran’s encroachment on Israel’s border with Syria and to counter the Iranian attempt to take over the devastated country. Hezbollah leader Hassan Nasrallah last week said that Israel had entered a “face to face struggle” with Iran and on Saturday again threatened to launch his impressive missile arsenal at the Jewish state. “The forces of the resistance (Iran and its Shiite proxies) today have the ability, the power, and the missiles to hit any target in Israel,” Nasrallah said during a speech on Hezbollah’s al-Manar TV station in Lebanon. Israel is now expecting a new Iranian cross border attack from Syria. This the reason the IDF released new satellite images showing Iranian air bases in Syria via which the Islamic Republic flow of weapons arrives in Syria. The IDF believes the attack will come in the form of precision-guided missiles, according to an anonymous IDF official who was interviewed by Arabic Sky News. The anticipated attack will be overseen by Qassem Soleimani, commander of the Quds Force of the Iranian Revolutionary Guards Corps, who aspires to become the successor of Iran’s Supreme Leader Ayatollah Ali Khamenei. According to the Lebanese news site, Ad-Diyar, Iran has already attempted to launch a new drone strike on northern Israel. Middle East analyst Michael G Pregent reported that on April 19. Russia prevented the new Iranian attack by shooting down three explosive-laden drones. The three drones reportedly departed from an area between Daraa near Jordan and Sousa south of Damascus and apparently flew the same route as the drone which entered Israeli airspace on Feb. 10, according to analyst Jennifer Dyer. The mounting tensions between Iran and Israel caused the IAF to cancel its participation in the Red Flag drill in Alaska which is tol run between April 25 and May 11. Iran’s increasing belligerent behavior toward Israel could be connected to what is currently happening in the Islamic Republic. The popular protests against Khamenei’s regime have not died down as became clear from video footage recorded inside a mosque in Iran on Friday. Worshippers shouted slogans against the regime and chanted that Iran’s real enemy is the Islamist regime and not the U.S. or Israel. “Our enemy is right here. They're lying when they say it's America,” the crowd chanted referring to the regime of the mullahs. Across Tehran, one can see graffiti expressing displeasure with Iran’s current foreign policy. “Leave Syria, think about us! No to Yemen! No to Lebanon and Hezbollah! Our lives for Iran,” anti-regime activists have painted on walls of buildings in Iran’s capital. The regime seems to be in serious trouble after Iran’s currency, the Rial, plunged further against the dollar last week while inflation in the country soars. The Iranian currency has lost close to half of its value against the dollar since September 2017. The price of vegetables rose almost 100 percent last week while chicken prices increased by 30 percent. Unemployment may have reached a staggering 45 percent, according to Iran watchers. Factories and other businesses had to lay off workers because they are no longer able to import goods and materials. As expected, Valiollah Seif, Governor of the Central Bank of Iran, is blaming the financial crisis on Iran’s enemies. “Enemies outside our borders, in various guises, are fueling this issue and are going to some effort to make conditions tougher for the people,” Saif told local media last week. Saif was most likely referring to statements made by John Bolton, the new security adviser to US President Donald Trump. Bolton is a proponent of regime change in Iran as a way to counter the growing threat posed by the regime. “The behavior and the objectives of the regime are not going to change and, therefore, the only solution is to change the regime itself,” Bolton told members of the Iranian opposition several months ago. He later said that new sanctions would have a crippling effect on Iran. Trump has indicated he will pull out the U.S. from the Joint Comprehensive Plan of Action, the nuclear deal between Iran and six world powers brokered by former US Secretary of State John Kerry. If that happens, sanctions against Iran will snap back and under the current circumstances, this could disrupt Iran’s hegemonistic drive in the region, which gained momentum significantly after the defeat of ISIS in both Syria and Iraq. All this explains why Khamenei last week suddenly warned that Iran is in the middle of a war against a “huge powerful front of enemies” and has to develop “offensive strategies”. His words signaled for the first time that the Iranian dictator realizes his regime is in serious trouble.